Is it just me or is nothing loading on this page? Oh, look – there’s a PICTURE there. That is a disturbingly apt avatar for that comment. So… page isn’t loaded yet, but judging by the cast lineup I’m guessing that Clair and Ulak are mourning their respective dead friends while Reynolds… I dunno. Plays a dirge on a keytar? Douche-Man! Douche-Man! Does whatever a Douche can! He’s a jerk! Any size! Self-esteem built on lies! Look out! Here comes the Douche-Man! Yes. Panel two. One of the few typos that haven’t been fixed after being pointed out. I love this more and more as it goes on. And I hope the press is under different management. I doubt Bedard would get a pardon after being Gastonia’s propagandist until the very end. They may have to let Bedard keep his position as head of journalism. They are trying to make a fair and free society so free press should probably be a part of that. I agree, but why Bedard? Because he’s the only one who knows how to run that blasted contraption? Also, it may not be clear how involved Bedard was. He was always pretty low key. Gotta say, I’d question how free the press under Bedard could be. He always seemed to be reasonably involved to me. It’s possible he was being blackmailed or otherwise controlled, though. What Dean Reynolds said on the subject didn’t strike me as ambiguous: The “altruists” were all selfish war criminals. If Bedard isn’t either in prison, executed, or self-exiled one step ahead of being arrested already, I would be surprised. I gathered that Pardo and Adric were granted pardons because the former was effectively removed from the worst decision making while the latter stood down upon realizing he was fighting for an unjust cause, but Reynolds was still bitter about that. Bedard wasn’t mentioned and he ran a smear campaign against the adventurers and savage races who are now running the government so at best he lost his seat at worse he’s incarcerated. In the end the bigoted admiral got the last laugh. He was banished by many of the same people who are now either dead or imprisoned and he’s sailing the seas saying I told you so to any human he finds. Something tells me Ashok has all the time he needs to practice trolling Ulak. And as an added bonus, Ulak needs to sleep. Ashok doesn’t. It’s the scribe elf. Katie Couric. Ah! So THAT’S the pun in her name! That would be fitting. And all things considered she deserved to be promoted beyond Syr’ng’s secretary. Kur’ik isn’t tagged, and that doesn’t look like her – her hair has more volume, her usual attire includes long sleeves, and last we saw her (which, it looks to me, was probably a couple hours prior to this), she wasn’t wearing a cape. Also, being in that tower with Claire suggests this is part of Claire’s staff (presumably another City Elf, although the design of their sleeves could be a Wood Elf ‘leaf’ edge), not an unaffiliated reporter. I swear if we’re getting a sequel following Best and the gang around the world on their airship I’ll squeek from delight!! They’ve left the Guilded Age behind and need to rely on their skill and might. It’s the Brawns Age. I think the sequel should be about the adventures of Payet Best’s son Second Best. Yeah, that’s really sweet. And kinda sad. Awww! He still loves his little gnome buddy Dean Reynolds! It’s kinda creepy, actually. Where and when else is he “watching” them, hmm? Rendering striped clothing effectively is quite tricky. You have succeeded beautifully here. Looks like the site has been infected, I keep getting an ad for an antivirus that replaces the page. Yes, MacKeeper has been plaguing me on this site and other webcomics for weeks. I think maybe I’ve finally solved it by installing the AdGuard AdBlocker Safari extension and blacklisting getmackeeper.site. Damnit Parker! I asked for pictures of Spider-Man, not for selfies of you in your halloween costume! It does seem as if Caneghem at least still cares enough to keep an eye on things. Now that he has the ability to get the cities out of dodge if he needs to, he might have the confidence to re-engage at some level if things seem to be going well enough. I doubt he ever will, Probably not until they can pin the Flying Islands and Force them to open their Gates again Admiral Perry Style, but that might not be for years and years. Or the Flying Islands population of Elders die out. Do keep in mind a Lot of Sky Elf Youngsters left, and the Elves aren’t immortal, just really long-lived. There’s going to be a Population decline eventually. I doubt they’d come back. I got the impression that the sky elves society was largely sustained by conjuration magic. So I suspect they’d have a lot trouble dealing with Claire’s restrictions on unauthorized conjuration. Ooo, locked in a prison cell, haunted by the friend you stabbed in the back. That’s going to hurt. *squint* Is..is that Hollister standing next to Clair? Same haircut and hair color, at least. Maybe he was knocked out instead of killed? He ain’t tagged soooooo nah, he’s dead Jim. As interesting as this is I’m far more interested in what’s gonna happen to their bodies. If someone isn’t maintaining them, well they all die. …Whose bodies? Either you missed out on major sections of the plot, or I’m not following you at all. So their bodies died but their still alive. Well that’s kinda dumb. Huh? If you’re talking about The Five, their Sepia World bodies are already dead. 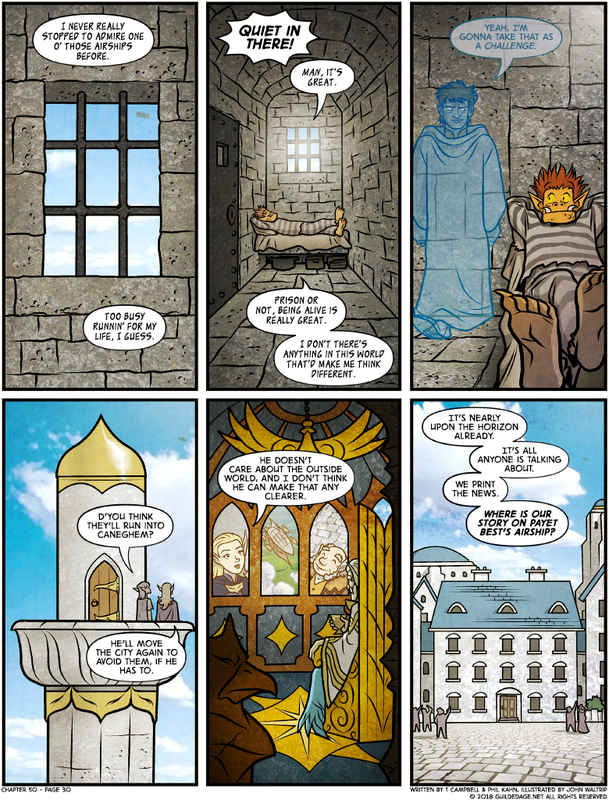 Very likely since they were first injected into Second Arkherra ( http://guildedage.net/comic/chapter-49-page-6/ ), but the very latest they could have died is when the feedback from killing HR apparently destroyed them ( http://guildedage.net/comic/chapter-49-page-48/ ). I think HR killed them with the tendrils that were coming out of his body, hoping that if he killed the tubed players, it would also kill them in Arkerra. I think Shanna and Xan were terrified of the tendrils that were starting to attack them while they were stuck to the ceiling, because they were watching other tendrils devour the tubed players. Seems like a lot of people didn’t catch Sepia World’s exit from the comic. Kingdoms of Arkerra is no longer online and is not coming back: http://guildedage.net/comic/chapter-49-page-52/ . Sepia World no longer has any connection to Arkerra. Immersed or not immersed, many of the characters have creators in Sepia World, but none now has a player. Sweet vindication. Enjoy the company Ulak. Man, Ashok is reminding me of Anakin Skywalker here. Sorry Ulak, even though you kinda came to your senses in the end AND you seem to have finally realized life is nice even while probably spending the rest of yours behind bars, you kiiiiinda deserve the forever-haunting you’re about to get. It’s obvious you didn’t think of Ashok as a good friend or it wouldn’t have been so easy to murder him with a deadpan expression so I don’t think you’re going to be reasoning with him or giving any apologies he wants to hear either. I always thought it was just because Ulak was more clued up about the situation. If neither had killed the other, I reckon he knew the cult would just have decided to kill both of them as sacrifices for refusing to make sacrifices. So if he hadn’t killed Ashok then Ashok would have died anyway, but by Killing him he got to continue to live himself. I didn’t think Ulak was real concerned about having to kill his friend or the possibility of dying himself–they were both death-worshipers, after all. I do, however, feel no sympathy for Ashok. “My friend and I were members of a death cult, the cult leader told my friend to stab me in the back, and he did it! I am so betrayed!” Pfft. Neh. I think Claire is being a bit unfair to Caneghem. I may be a bit biased, but I don’t see that I’d do all that much different in his position. Isolationism is a means-to-an-end, not an end into itself for him. It’s easy to characterize that as a stodgy unwillingness to adapt, but I think people underestimate just how much work it’d take to recolonize new lands just to maintain national independence. I don’t think anything in his personal experience would lead him to believe that the Savage Races wouldn’t just be Gastonia 2.0. That’s a nice prison cell than the one I was in, and no cellmate? He does have it good!